Downton Abbey Bottle Blunder – Genuine Mistake or Clever Guerrilla Marketing? 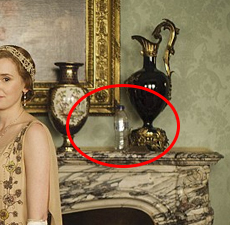 Poor Downton Abbey hit the headlines this week for all the wrong reasons when eagle-eyed fans spotted a modern plastic bottle in a promotional photograph for the forthcoming fifth series. The hit TV show which is often commended for its accurate depiction of life in 1920’s Britain ignited an online sensation when the continuity error was spotted and it quickly went viral – compromising the shows authenticity as plastic bottles didn’t become available until some forty years later! It’s always funny when such a gaffe is made so publicly, but I’m dubious towards the authenticity of the blunder. A genuine mistake? I’m not so sure. Clever guerrilla marketing? Quite Possibly! As a Professional Designer and an Amateur Photographer I’m hard-pressed to believe that this is a genuine mistake that went unnoticed until after it reached the public domain. I have a love / hate relationship with photography, the effort involved in getting that “perfect” shot is extraordinary, and yes that might be my lack of professionalism in the subject, but with that being said I’ve also spent a fair few hours on a professional photo shoot as a Digital Designer too. That perfect shot is usually subsequent to multiple captures and a little tweak here and there in Adobe Photoshop. Furthermore, with the number of people on set there’s plenty of eyes on the subject. For those reasons alone I’m more inclined to think that this is more a case of guerrilla / viral marketing. They do say there’s no such thing as bad press and this blunder has lodged the new series of Downton Abbey firmly in the minds of eagerly awaiting fans around the world. I don’t think the ITV bosses are that worried! It’s not their first historical blooper and I’m sure it won’t be the last. All I know is they should have called PixelstoLife – 5 minutes in Photoshop and Et Viola! Got to love a bit of photo manipulation!